The maximum temperature on Monday was 16.6ºC and the minimum 1.0ºC. The maximum relative humidity was 97 per cent and the minimum 52 per cent. OUTLOOK FOR TUESDAY: Partly cloudy day. Temperatures: (Past 24 hours change): Minimum temperatures fell in Haryana, Punjab, east Rajasthan and Uttar Pradesh and changed little elsewhere. Departures: They were markedly below normal in Punjab and east Rajasthan, appreciably below normal in Haryana, west Rajasthan, west Uttar Pradesh and Uttaranchal, below normal in Himachal Pradesh and normal in the rest of the region. The lowest temperature in the plains was 1.7°C recorded at Amritsar (Punjab). Forecast valid until the morning of December 31: Rain or snow is likely at isolated places in Himachal Pradesh, Jammu and Kashmir and Uttaranchal. Weather will be mainly dry in the rest of the region. Low temperature warning: Ground frost is likely at a few places in Haryana, Punjab and Rajasthan and at isolated places in west Uttar Pradesh during the next two nights. 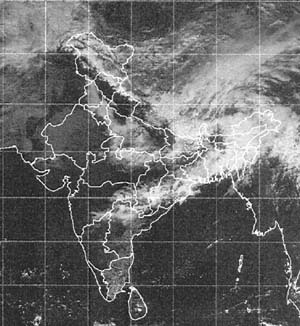 Forecast for Delhi and neighbourhood valid until the morning of December 31: Partly cloudy sky. Fog in the morning. Chilly winds likely during day. Minimum temperature will be around 5°C. Farmers’ weather bulletin for Delhi and forecast valid until the morning of December 31: Sky will be partly cloudy. Cold conditions prevailed in Punjab and Haryana even as the movement of rail and road traffic was again affected by the dense fog and chilly weather conditions today. Almost all long-distance trains running on the Delhi-Ambala-Kalka section were the worst hit as they ran behind schedule by three to six hours, railway sources said. Some of them were cancelled, stranding thousands of passengers, mostly commuters at the Sonepat and nearby railway stations. The New Delhi-bound Jammu Mail passed through Sonepat more than four hours behind schedule, the sources said, adding that Jhelum Express bound for New Delhi also ran behind schedule by more than two hours. The New Delhi-bound Bathinda Intercity and Amritsar Super were cancelled. Unchar Express and Shan-e-Punjab were also behind schedule. Suburban trains running between Kurukshetra and Delhi as well as Panipat and Delhi were delayed for half hour to one hour. Traffic on the national highway and the state highways was also affected on account of a thick blanket of fog and poor visibility. One person was killed and two others were seriously injured when their motorcycle was hit by a vehicle near Kakroi village, 9 km from here late last evening. The victim was identified as Naresh of Sham Nagar, Sonepat. SHIMLA: The intense cold wave sweeping the tribal areas and higher reaches of Himachal Pradesh continued unabated on Monday even as people in the lower areas had slight relief due to marginal rise in day temperatures. Thick ground frost in the mid and higher hills hampered vehicular traffic and water taps were frozen in many areas as the minimum night temperature continued to hover around the freezing point.